Keep the family together on this warmly weathered sign, featuring distances from each other. Your loved ones may be scattered across the globe, but this personalized signpost finds a charming way to keep them all in one place. Hand painted to create a warmly weathered finish, each signpost is topped with your family name, followed by up to five arrows showcasing each member's distance and direction from your official homestead. The arrows are plasma cut by Chris Crooks and positioned slightly askew to create a classic look, and an oxidized steel finish develops a lovely patina over time while offering weather-resistant appeal. The result is a colorful statement for your yard or garden that keeps your family close. Made in Tucson, Arizona. Arrows: Family member names (and their distance from your home) and the direction of the arrow, pointing east or west. Click here to see other customization ideas and assembly and installation directions. Just want the signs without the signpost? Check out the Personalized Directional Sign. 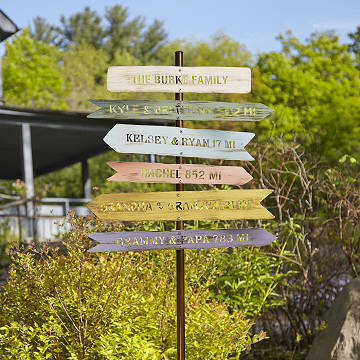 Click here to see the Personalized Family Member Signpost art. The finish can be maintained by applying car wax once a year, or as needed. Click here to view assembly and installation directions. Perfect present for my Dad's 70th birthday! This was such a great gift! I had it personalized with the distances to all of his favorite places. It was neat to see him unwrap each sign and see his reaction. The quality of the metal signs is great and the turnaround process for getting the proof and the delivery was within two weeks. So I was able to get it done in time for his actual birthday. My daughter in Australia put me onto this product. You get exactly what you see on the internet. A good quality product. It is a bit hard to read from a distance if the background is not contrasting. Gift for son in law. Can't speak to durability as just received, but all metal construct looks to be durable. Love that name/mile markers are cut out of metal & not just painted on sign. We were all pleased w it. Seemed expensive when ordered sign, but now see quality justifies price. Hi, Chris! I absolutely LOVE the quality of the sign, but mine had a couple of issues. All of the arrows were pointing in the wrong direction and the post was drilled incorrectly. Again, it's a beautiful sign except for these issues. Thank You! Great gift and reminder of family! I love the colors and the beautiful reminder of our kids who all live away. What a sweet sign for my mother to reminder her of her children. She loves to garden. This will look.so adorable next to the birdhouses she had all her grandchildren make. Amazing craftsmanship! Loved the colors, even the screws came painted in the different colors. I plan to buy another one for my daughter and husband after they build their house. Amazing gift! Brother has a getaway home on north shore of Lake Superior. Family gather for reunions at various times throughout the year. In past years, I have ordered family tshirts. This sign post makes a more permanent addition to the family. This was a beautiful gift for my parents. It reminds thenof our family every time they look outside. I like the size and colors of the arrows and it is very easy to assemble.